KTKT published charts on a weekly basis during 1964. The 1964 charts were of the same style and design as was introduced during the latter half of 1962. The charts were printed on a piece of paper measuring 8 1/2 inches wide and 7 inches long. Folded in half length wise the paper would form a small four page brochure. A different color of paper was used each week alternating between blue, green, yellow and a pale tan color. 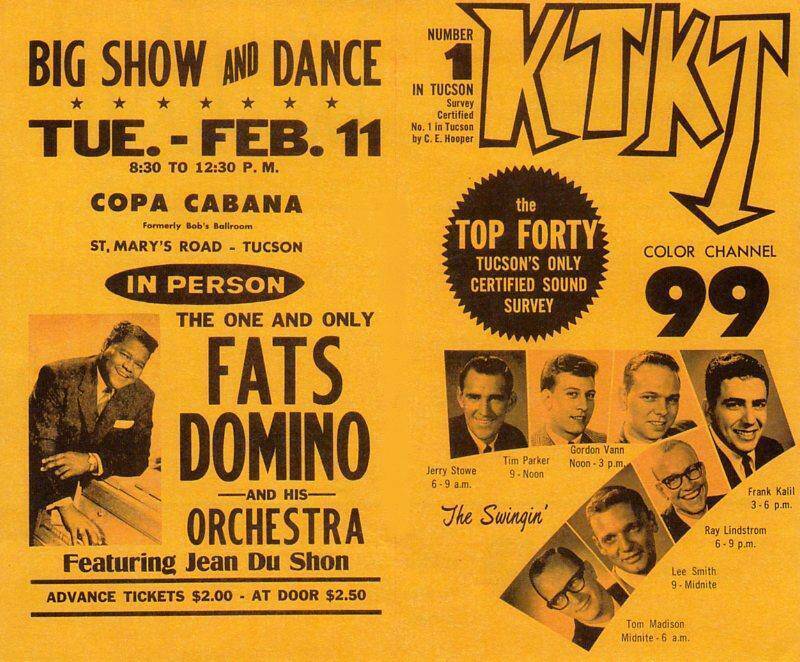 The front cover of the chart had the KTKT logo across the top, Just below the logo was the KTKT DJ’s – called the Swinging Seven – pictured and listed inside a large drawing of the number seven. On the upper right hand corner of the chart cover KTKT proclaimed its position of being rated number one in Tucson by both C E Hooper and Pulse – the two big rating companies of the sixties. When this brochure was opened the weekly top 40 was displayed - with 20 songs on each page. The bottom of the page often listed titles for the “Album Sound Of The Day” supplied by Johnny Barker’s Record Counter. The back cover of the chart was used for many things – often KTKT promotional announcements and humorous messages – while at other times ads would appear. 1964 was a watershed year in rock and roll history due to the success of the Beatles and the following British Invasion. The Beatles make their KTKT chart debut at #25 with “I Want To Hold Your Hand” on the chart dated week ending January 24 1964. Reaching #2 the following week the song went to #1 the week ending February 7 and held the top position for a total of six weeks. “She Loves You” joined the top ten the week ending February 14 at #3 and reached #2 behind “Hand” the following week. The following week ending February 28 The Beatles achieved a triple play holding the top three positions when “Please Please Me” zoomed to # 3 behind “She Loves You” at #2 and “Hand” at #1. The flip side “I Saw Her Standing There” made its first separate KTKT chart entry the week ending February 28 as the co - ranking number one song. The week ending March 13 marks the first entry as a separate listing for the flip of Please Please Me” - as “From Me To You “ makes its first appearance as the co-ranking number 3 record. This gave the Beatles a total of five songs holding the top three positions on the KTKT chart. This same chart also has the debut of “Twist & Shout” by The Beatles at # 15 giving The Beatles a total of six songs on one chart – all ranked #15 or higher. When “Twist & Shout” jumps to #1 the following week ending March 20 the Beatles held the top 4 positions with a total of six songs listed including the charted flip sides. For the week ending March 27 1964 the Beatles reach a new KTKT chart high when they have a total of nine songs on one KTKT chart as “Can’t But Me Love” debuts at #10 and “Do You Want To Know A Secret “ with the co – ranked flip side “ Thank You Girl” make its first chart appearance as #35. As for the following British Invasion artists The Dave Clark Five are the first post Beatles group from the other side of the pond to chart at KTKT when “Glad All Over ” enters the top 40 for the week ending March 27 1964. The Bachelors –from Dublin Ireland - are next when “Diane” debuts at # 20 the week ending April 10 1964. The Swinging Blue Jeans with “The Hippy Hippy Shake” are the third charting British Invasion group the week ending May 8 1964. Billy J Kramer& the Dakotas are next to chart the week ending May 15 1964.The Searchers enter the KTKT chart the week ending May 22 1964. Peter & Gordon are the sixth British Invasion group to chart on KTKT as that duo debuts on the top 40 the week ending May 29 1964. Other British Invasion acts to chart on KTKT during the summer of 1964 include Chad & Jeremy (June 12), Gerry & the Pacemakers (July 3), Cilla Black (July 3), Dusty Springfield (July 10), and the Animals (Aug 14). Other British Invasion artists charted later in the year include P J Proby, Manfred Mann, the Nashville Teens, the Honeycombs, the Kinks, the Zombies and y Herman’s Hermits (Dec 11). The Hullabaloos and Cliff Richard - who had charted in years prior to the Beatles -also made debuts on the KTKT Chart for the week ending Dec 25. Interestingly the Rolling Stones did not chart on KTKT until the week ending November 11 when “Time Is On My Side” debuted at # 33. The Stones first US release ”Not Fade Away” was the KTKT pick hit of week July 3 but failed to chart. The Stones next two US releases “Tell Me” and “It’s All Over Now” also failed to make the KTKT chart. Starting in June 1964 British Invasion acts managed to chart every week - ranging from a low of seven songs to a high of fourteen songs -every week during 1964 on KTKT. An explanation is in order for a few remarks from the back cover of a few of the 1964 KTKT charts. References to frogs, leashing frogs and a frog leash law on the back cover for the weeks ending March 13, May 1964 and May 29 1964 refer to a running on air gag carried out by Jerry Stowe (6 – 9 am) and Frank Kalil (3 – 6 pm). During the first few months of 1964 it seems Tucson was enveloped in a controversy that surrounded a proposed city ordinance that called for all dogs to be on a leash when not fenced on their owner’s property. I think it all started due to a dog at large either barking or showing unwanted affection at a leading citizen of the city. This proposal sparked a really big public debate on a level usually reserved for issues such as civil rights or gun rights. It seemed as if everybody in Tucson chimed in at point or another. The two daily papers carried articles, editorials, and letters to the editor on the matter daily. 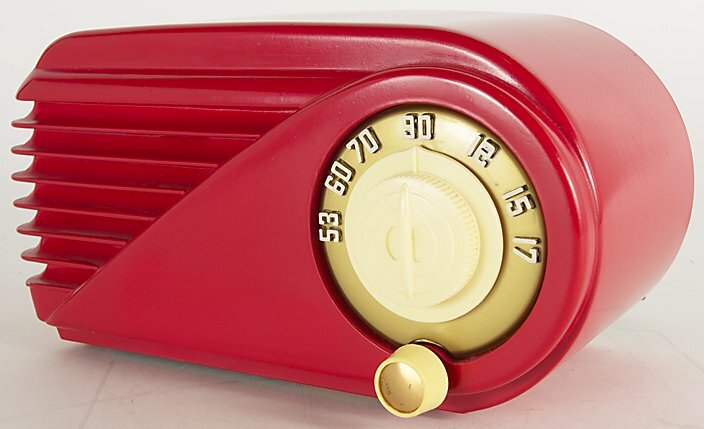 Local TV and radio broadcasts hawked the story daily, hourly in the case of radio. KTKT general manager Phil Richardson made the issue a subject of a few of his morning editorials on KTKT. Every citizen seemed to have an opinion here. One day while on the air during his afternoon show Kalil - while joking – made a remark about getting “slimed” by a frog’s tongue - while working in his yard. Kalil said that all frogs should be leashed. Jerry Stowe picked up on the gag and took up for keeping frog’s leash free. It was all a running gag- a satire if you wish – on a current event that had all of Tucson’s attention. For what it is worth Tucson city council did pass the dog leash law. Once again a big thank you to my friend Jim Chrisman for having the wisdom to keep his KTKT chart collection all of these years. All of these 1964 chart images – a total of 49 out of 52 possible weeks - are from original KTKT charts in Jim’s collection. Notice that starting May 22 Jim jotted down the weekly pick hit of the week on most of the remaining charts. KTKT never listed the pick hit on the charts because by the time the DJ’s met Thursday evenings to select the upcoming pick hit to debut on the following Saturday the new charts - which also debuted on Saturday – would have been already sent to printer. So thanks to Jim we get to see about half of the 1964 pick hits. To view a slide show of the charts from 1964, click on the button below. As it appears, you can stop, start, fast forward, or go back by using the controls at the bottom of the page.